We were asked recently if we knew of any Beer Can Museums in the USA. I figured we should share this information. Feel free to add any info or places you know about world-wide. Claims to be the "World's Largest Beer Can Collection"
I don't think it is open to the public, but if you contact the owner, you may be able to arrange a special visit. 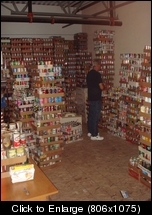 There is also a can museum (Soda & Beer) in Tennessee open to the public (I've been there twice). Also claims to be the "World's Largest Beer Can Collection"
The Museum in Tennessee is closed. I didn't realize that when I posted about it. This is sad because it was my first visit to that can museum that inspired me to be a collector. "Collecting is one of our passions here at Nostalgiaville. We hope you spend many hours enjoying our site. We also encourage you to donate any images, stories or documents that pertain to our subjects. If you have any old beer or soda cans, bottles or old magazines... We would LOVE to have them to add to our archive! We have a vast amount of on-line and off-line images and historical information, yet we don't charge anyone to access it. Why become a contributor? Because we need your HELP! Running this website is a labor of love but it's not cheap. OUR OWNER/DEVELOPER AND NOSTALGIAVILLE EXPLORER, PAUL BATES, PASSED AWAY IN DECEMBER OF 2009 AND THE WEBSITE IS IN A TRUST WITH THE LAWYERS. AT THIS TIME, THE PAUL W. BATES FAMILY FUND IS KEEPING HIS MEMORY ALIVE ON THE INTERNET THROUGH THIS WEBSITE. THERE WAS SO MUCH LOVE & EFFORT PUT INTO THE DEVELOPMENT OF GONO.COM . ALL THE IMAGES AND INFORMATION ARE FREE TO ANY ONE THAT WANTS TO VIEW THEM. WE WOULD GLADLY ACCEPT DONATIONS TO THE ESTATE OF THE PAUL W. BATES FAMILY FUND, TO HELP IN MAINTAINING HIS ONLINE LEGACY. I have contacted them, and I hope they get back to me. I am going to ask if we can do anything to help and if we can have any info or photos for our site, CanMuseum.com. "The Museum of Beverage Containers can trace its roots to the mid 1970's when teenager Tom Bates, son of Paul Bates, picked up a couple of rusty old beer cans on his way home from the school bus stop. See MUSEUM... in the BEGINNING. 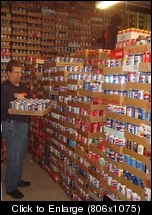 In 2002, the collection from the Museum of Beverage Containers was split, The soda collection was moved to the Nostalgiaville tower in Springfield, TN. 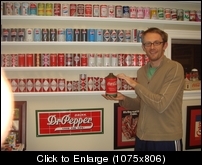 In 2010 the soda collection was sold to a good friend and collector in Indianapolis, IN. A virtual TOUR of the MUSEUM will provide a glimpse of the site before the collection was moved. 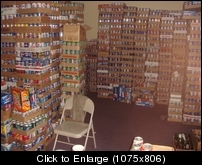 The Beer Can, breweriana section of the museum still exists in storage in Millersville, TN. Hopefully one day it will be restructured. The soda collection from the museum was relocated on the FARM at NOSTALGIAVILLE, in Springfield, Tennessee. A virtual tour begins at the VILLAGE. A personal tour can be arranged by A VISIT to the FARM. If you are a collector of Soda or Beer memorabilia, the COLLECTOR INFORMATION section will be a big help with useful information to add to your collecting knowledge. We spent many hours... Enjoy! "The Farm is now closed to the public"
The soda cans were sold to a can collector in Indianapolis, IN. Yes that museum was bought by a friend of mine in Indianapolis, IN. It was actually one of about 10 superb collections he bought recently. Here are some pictures of his traders, and collection. WOW! Thanks for sharing those photos! What an awesome collection. Looks like he has his own warehouse! 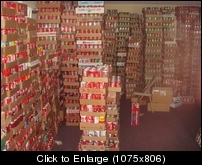 I know I have no where near that many cans.... but I miss the good old days when I had a 3 bedroom place - one was where I slept - the other was storage of cans (very full), and the other was my shipping/receiving room. Man, do I know that feeling! 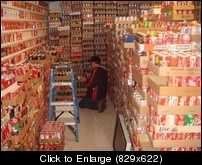 Way back in the late 80s/Early 90s, when I was in high school I had shelves on 3 walls of my bedroom filled with my can collection. Today, I have my own house, but everything is in boxes taking up 1/2 of my basement, the other 1/2 is drums, amps and other music equipment. Wen I was in apartments I paid for public storage. I would love to have a live "museum" of my own someday, but for now a virtual museum at CanMuseum.com will have to do. 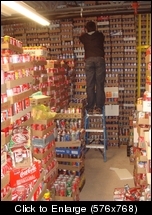 I just think back to the museum in Tennessee and it was just amazing walking up an down the aisles of beautiful cans. To see so many designs and all together side-by-side just left me in awe. One of the sets of cans that stood out to me on one of my visits was the Sunday Funnies cans. They had Blondie, Hagar, and other comic strips on each can. Here are a few: bit.ly/rItxBm I'll have to dig up some old photos of my bedroom can walls to post. Those are really incredible pictures. I'd also love to see a collection that size displayed live-in-person. It would probably look great at an art or design college.